This spring I want to rediscover many of my favorite Neighborhood Greenways and discover new great places to ride. The Neighborhood Greenways were my best friends when I first landed in Portland. I discovered Portland by bike, and biking was a great way to experience the city. If you don’t know about these bike routes, check them out! I still love riding along these quiet streets nestled in Portland’s neighborhoods. Nice Little Tour: Yesterday’s ride was no exception. The sun was bright, and the winds were calm. So I set out on a quick little east side tour. 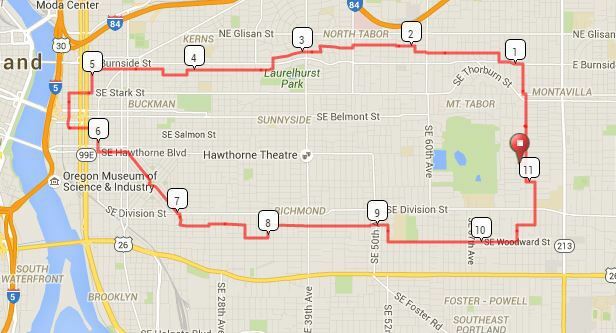 Starting near Montavilla, I enjoyed my ride through North Tabor down NE Davis and Everett towards Laurelhurst. I couldn’t help but notice how the city has changed since I first took this route. More, newer homes line the streets. More traffic on the streets. More bikes taking the greenway. SE Ankeny is Growing Up: Some of the biggest changes are further west down SE Ankeny. The street is bustling now with cafes and shops. Apartment buildings dot the landscape. It’s a bicycle mecca it seems, with more bikes than cars at times. The changes come alive while on bike. I thought if I were 20 years younger and didn’t want a car, this neighborhood would be a great place to live! 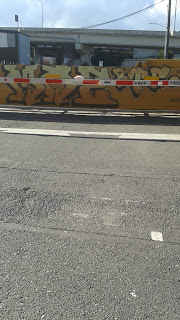 The Trains of SE: The greenway abruptly ends near the waterfront, so I carefully navigated my way towards SE Water Avenue. It wouldn’t be a ride down to the east side waterfront without waiting for a train. 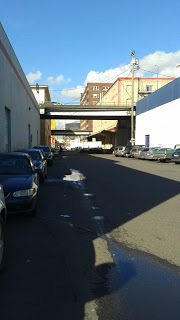 After waiting 5 – 10 minutes, I decided to cut through one of the industrial side streets between SE Stark and SE Hawthorne. Despite dodging some large vehicles, the detour was worth it! Again, I couldn’t help but notice how different this area is from 7 years ago. Big Questions: This is a question all Portlanders grapple with right now. Portland is growing. We cannot deny that. It feels like Portland is growing into a big city with all the inherent benefits and problems. Portland is a city full of creative people, natural beauty, weirdness and arts. Yet Portland is a place with a serious affordable housing problem. The streets are changing around us as we make room for more people. Portland’s Heart: How do we best manage this growth so all who live here benefit – the newcomers and long-time residents, the well-to-do and those who struggle, and everyone in between. I have faith in the heart of Portland because it is the heart of all of us who live here. I experience the Portland spirit through this blog and where I work. I believe that spirit is strong and will survive. I’m hopeful Portland will emerge as a wondefrul big city with the heart of the Portland we love. PS. A new story from an amazing artist is coming soon.